As Lexa spoke the words, she knew they were true. She knew with total certainty. When Lady Nightwing kidnapped Dr. Timberi, everyone assumed their teacher had been killed. So when Lexa discovers that he isn’t dead, Conner can’t believe his ears. Determined to rescue their favorite teacher, Conner, Lexa, and Melanie confront their worst fears and use their powers in unexpected ways to defeat Lady Nightshade, the treacherous Darkhand leader. But when the trio makes a terrible choice to save Dr. Timberi, their powers may not be enough to keep everyone alive. A thrilling conclusion to the Middle School Magic series! Your favorite characters return in this satisfying conclusion of the Middle School Magic series! 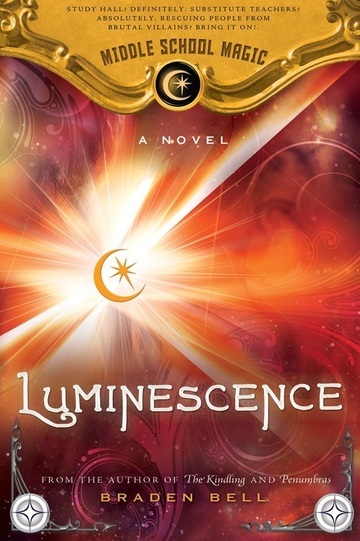 Filled with plenty of twists, humor, and adventure, Luminescence will keep you guessing until the last page. Study hall? Definitely. Substitute Teachers? Absolutely. Rescuing people from brutal villains? Bring it on! During his middle school years, Braden Bell was the least-stable, lowest-achieving student in the history of the world. He shocked every former teacher by graduating from high school and college, and then going on to earn both a Master’s degree as well as a Ph.D. A teacher by day and a parent by night, he is around teenagers 24/7. He teaches music and directs plays at a private school, much like Marion Academy in The Middle School Magic series. Whether he fights evil after hours is something he cannot disclose. 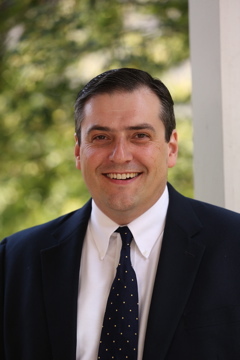 Braden Bell holds degrees in theatre from Brigham Young University and a Ph.D. from NYU. A committed educator, he has been directing plays and teaching school now for over twenty years. Braden lives with his family on a quiet, tree-lined lot outside of Nashville, TN, where he teaches theatre and choir at a middle school. The author of The Road Show, The Kindling, and Penumbras. Participants in the Luminescence blog tour will be allowed one entry for their site in the rafflecopter for a $25 Amazon giftcard or Paypal cash. Book Summary : The Slayers – teens who have powers to fight dragons—are back by popular demand in this high-octane sequel, now with a new cover package! Tori is at a White House dinner party when she hears a horrifying sound: dragon eggs hatching. It means in less than a year, the dragons will be mature and dangerous. The Slayers are well-trained, but their group is not yet complete, and Tori is determined to track down Ryker Davis, the mysterious Slayer who has yet to surface. What Tori doesn’t bargain for, however, is the surprising truth about her powers: she isn’t a Slayer after all, but a Dragon Lord, with a built-in predisposition to protect dragons, not kill them. How will she overcome this to save the lives of her friends? Fire and Ice is arranging the blog tour for Janette Rallison / Feiwel & Friends. I am currently accepting blogger applications now to host a stop on their site October 15th- November 2, 2013. Fill out the form below to be considered for this tour and feel free to email Heather with any questions! 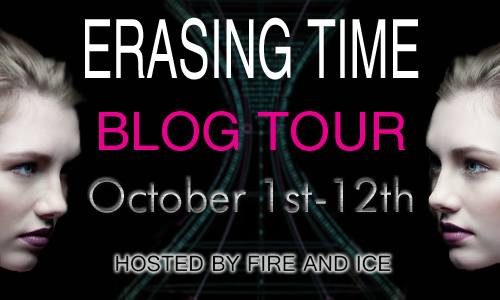 Fire and Ice is pleased to announce we will be hosting the official blog tour for Erasing Time by C.J. Hill! We have an exclusive guest post below with the author about her “playlist” for the book. “Some authors listen to playlists while they write their books. I envy those writers because apparently they can multi task so well they’re able to hum along to music and write at the same time. Knock sounds on my door, reminding me that I’m not really 400 years in the future with a hot guy being chased by mob assassins. I am, instead, a mother of teenagers. Son: (whining) The computer is locked! Me: That’s because you need to do your jobs. Son: But I did my jobs. Me: No you didn’t. You’ve got dishes this week and the sink is over flowing. Son: Can you unlock the computer now? Me: There is no possible way you did the dishes in thirty seconds. Go finish them. Me: AHHHHHHHHHH!!!!! Let me write!!! Immigrants must all wonder what we do in our free time. Anyway, I started thinking about time travel and how you couldn’t go very far in either direction before English became undecipherable. Don’t believe it? Go watch a Shakespeare play. Chances are, unless you already know the story or you studied Shakespearean English in school, you’ll be completely lost. Writers who write historical or time travel novels know this, of course. Usually we give a flavor or hint of the old language without being true to it. For Erasing Time I wanted to use the language shift as part of the plot. When Sheridan and Taylor are sucked into the future, historian wordsmiths are appointed to translate and interpret for them. (One of whom is a hot guy.) The only way Sheridan and Taylor can communicate secretly is to speak in slang. Which works quite well. You can cover just about any topic using slang, including escaping from mad scientists in a dystopian government. 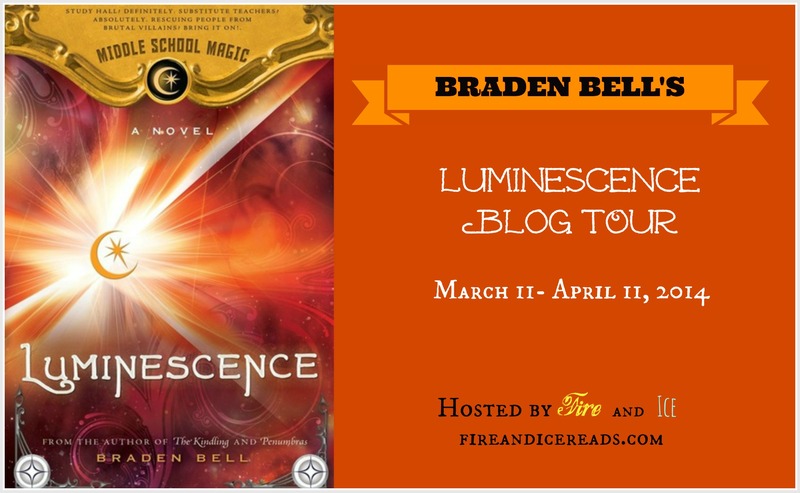 Thanks to C. J for choosing Fire and Ice to host her tour and for the fun guest post! Follow all of the blog tour schedule for your chance to win a copy of the book on each stop. Book Summary From Harper Collins: When twins Sheridan and Taylor wake up 400 years in the future, they find a changed world: domed cities, no animals, and a language that’s so different, it barely sounds like English. And the worst news: They can’t go back home. The twenty-fifth-century government transported the girls to their city hoping to find a famous scientist to help perfect a devastating new weapon. The same government has implanted tracking devices in the citizens, limiting and examining everything they do. Taylor and Sheridan have to find a way out of the city before the government discovers their secrets. To complicate matters, the moblike Dakine has interest in getting hold of them too. The only way for the girls to elude their pursuers is to put their trust in Echo, a guy with secrets of his own. The trio must put their faith in the unknown to make a harrowing escape into the wilds beyond the city. 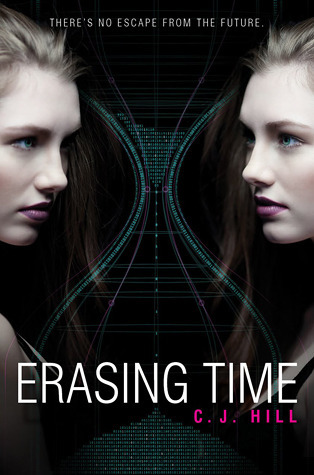 Full of adrenaline-injected chases and heartbreaking confessions, Erasing Time explores the strength of the bonds between twins, the risks and rewards of trust, and the hard road to finding the courage to fight for what you believe in. About the Author: C. J. Hill is the mother of twins. They aren’t identical, but this doesn’t mean she always calls them by the right name. In fact, she occasionally calls all her children by the wrong names (she has five) and has even been known to throw the dog’s name into the mix. Laugh now, but you’ll do the same thing when you have kids. If C. J. had a time machine and could visit another century, she would probably go to the Regency era instead of the future. According to all the novels she’s read, the past was filled with a multitude of dashing lords and viscounts who were always on the lookout for damsels in distress, whereas the future is populated by scary dystopian societies. The Giveaway: We have one copy of Erasing Time to give away to our U. S. readers courtesy of the author and Harper Teen. Choose your own entries on the rafflecopter form below to enter.